Yilun Zhou works with the team’s picking robot at the Amazon Picking Challenge in Leipzig, Germany. From exciting advancements in automated cars to attack drones, the field of robotics has experienced tremendous growth and development in the past few years, leaving little doubt about a future in which robots and humans will share the road, sky and world. But as Kris Hauser, associate professor of electrical and computer engineering, says, the robotics field should not be overhyped. Even with the progress and innovation seen in recent years, robotics still poses difficult problems that cannot be solved overnight. 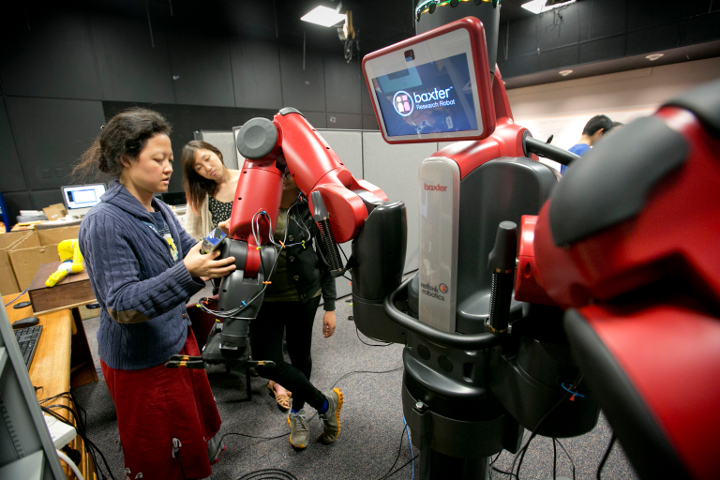 At Duke, Professor Hauser teaches Pratt graduate and undergraduate students how to chip away at large robotics problems in the course ECE 496: Advanced Robotic Systems Design. Through the class, students explore the many types of real-world challenges engineers will face building complex systems. In 2016, the class was asked to design a robot to compete in the Amazon Picking Challenge (APC). As the largest online retailer in the world, Amazon has millions of items in the warehouse that have to be packed and shipped by hand. With increasing demand for online shopping, robots that can autonomously pick up the desired items from the shelves have the potential to greatly improve efficiency in the warehouse. The APC competition provides a unique venue for research teams all around the world to propose solutions to this interesting and challenging problem. For the competition, Amazon used common household items to test the robots, including soft clothing, boxed DVDs, bottles of water and a toothbrush. To successfully pick up these diverse objects, the robots must first recognize and locate the target objects. Next, a motion planning approach controls the movement of robot arms to steadily pick up the items and put them in the right place. Like the human brain, the autonomy of the robotic system is based on perception and actions—recognizing the object, sending the signal from sensors to the system and creating a control strategy, which results in the robot arm grasping the object. With these defined tasks and goals, the Amazon Picking Challenge created an atmosphere that captured the fun and exciting nature of competition—as well as its stresses. 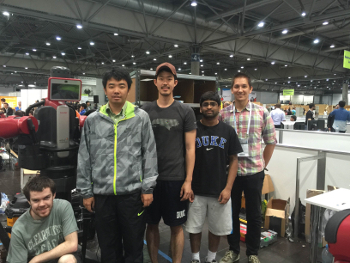 Last summer, thanks to support from Pratt and the Lord Foundation, Duke sent three undergraduates and one PhD student from ECE 496 to compete against 15 of the world’s top professional engineering teams and schools in the second Amazon Picking Challenge competition in Leipzig, Germany. Duke’s team was prepared with a number of unique tricks up their sleeves, like using scales to help recognize objects through weight as well as appearance, which helped their perception system work flawlessly during the competition’s stowing task. However, they still encountered intense challenges in Leipzig. It wasn’t until after competing that Hauser’s team discovered the reason for the failure: due to some last-minute hacking, a parameter for the vision module was off by a single decimal point. 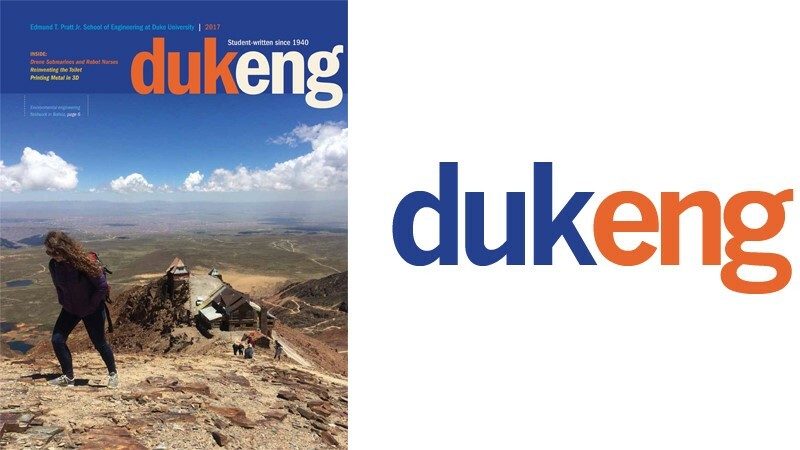 Even so, Duke’s team placed 8th overall—surpassing many other more experienced and better-funded teams. Professor Hauser commented that for their level of experience and resources, the team did very well: according to an analysis of the 2015 Amazon Picking Challenge, most participants were graduate students, post-docs or other professionals. No other team in 2016 was composed primarily of undergraduate students. The fact that they were able to compete on an international stage highlights the Pratt School of Engineering’s deep commitment and investment in preparing and motivating students to solve real-world problems. Working in large teams is another real-life challenge that engineers face, and the students in ECE 490 learned how project management, goal-setting and interpersonal communication are important for maintaining a smooth-running team. “As much as I lecture about these topics in class, they usually need to be learned the hard way, and it’s better to fail in class than later on in the workplace,” said Professor Hauser. Beyond the competition, the Amazon Picking Challenge reflects recent trends in the field of robotics, where techniques once seen only in academic research—like object recognition, motion planning and grasp planning—are being used in industrial applications. The process of designing and building robots for the APC is already making significant contributions to the development of autonomous warehouse robots. There are many practical problems, however, still undergoing research. For example, in Amazon’s warehouse, there are thousands of possible objects to recognize rather than a few dozen, and they are packed five to ten times more tightly than in the challenge. Humans are also many times faster than even the robots from the top-placing teams. It is anyone’s guess as to whether these challenges will be cracked in the next few years, or even the next few decades. Guangshen Ma is a master’s student in mechanical engineering.